So, mom and me (who were incidentally celebrating a long weekend ALL by ourselves, having packed kiddo and S out) , decided to indulge in some treats , and the unanimous decision was for a mixed bhajia platter. An occassional indulgence is worth the wait, and this time we didnt even wait to add the ketchup (or make any green chutney) - off the pan it went into hungry and eager mouths, accompanied by steaming cups of green tea / milk tea respectively for me and mom :-) Pure bliss !! Prep time : 10 mins. Cooking / Frying time : 15 mins. Serves : More calories than your waistline can take :-). 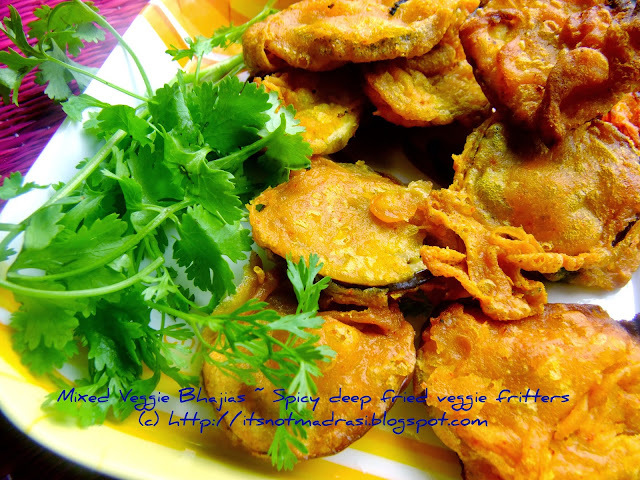 The following ingredients makes 10 - 15 medium sized bhajiyas. 1) Sieve besan and rice flour well together in a bowl. 2) Heat the oil in a deep bottomed pan. 3) Add salt, turmeric, ajwain, asafoetida and chilli powder (and chillies if using) to the dry flours and mix well. Thanks for sending over to the event.. Lovng these fritters..